I’m sure Quinssa and Friends of The Stoop are already onto this but with the QF being an away game getting as many people up to Sixways could make a big difference in terms of getting the win! With this in mind, is it possible for Quinssa / Friends Of The Stoop to highlight the best blocks to sit in so we can all sit together and generate as much noise as possible? 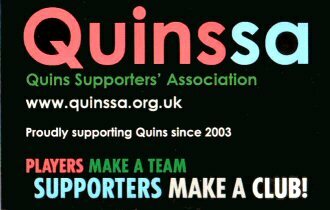 Hopefully, whether people get tickets from Worcester direct, Quins or Quinssa, this will mean we will all be together - “loud and proud”! Although the game is likely to be on BT Sport if you can make it to the game then I’m sure it could make all the difference! Let’s do this! Normally for a Euro game you won’t be able to get them direct from Worcs until after their STH holders have bought. Quins May limit original applications to STH holders as well it depends how many tickets we get. I think we have to get one third of Stadium. It maybe as this is challenge cup it maybe different with not so many wanting tickets. Always good to know where the Quins Are, that way those of us who don’t want to sit with them, can choose accordingly! No offence, but I like mixing in with the home crowd! Plenty of time for that pre/post match Nev! They can apply for as many as they like - neither myself or anyone I know will now be going due to the ludicrous kick off time. Yes. I didn’t include people I don’t know. We’re gutted but no way we can make that work.